What do you do when you have a massive supply of apples gifted to you? Make apple bread/cake, of course. I followed this recipe exactly the first time around, except I used half gluten-free flour and sprinkled some brown sugar on top. It is so scrumptious. Bathe that apple bread in egg, cinnamon and a dash of vanilla and cook in lightly oiled frying pan. Add one peeled and sliced apple to a melted tablespoon of butter. Sprinkle with cinnamon, and a touch of allspice and nutmeg. Cook until softened, add a tablespoon or two of maple syrup toward the end. 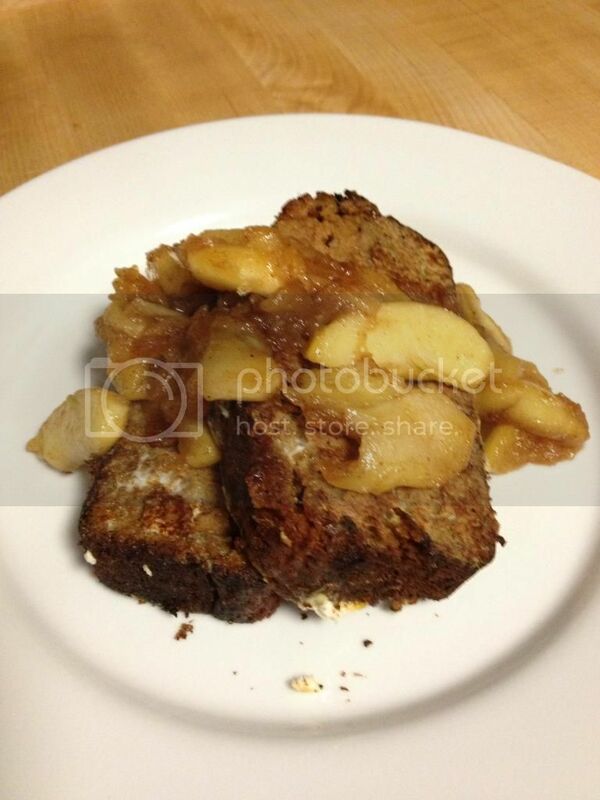 Pour over apple bread french toast. Devour in a smug self-satisfied way for thinking of such genius use of this decadent bread.